Holly Story from the Library’s media team has been delving in to one of our many historical recipe books. Here’s what she discovered from the point of view of a curious cook rather than an historian or archivist. 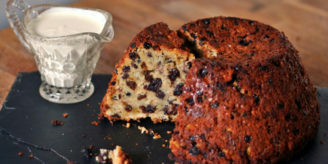 In the Library is a hand-written recipe book full of big flavours, spices and boozy puddings. The index of recipes combines festive essentials such as roast goose and trifle with treats like little plum cakes, saffron syrup and black cherry brandy. It sounds like a book that could grace the Christmas list of any avid ‘foodie’ today, but this extraordinary collection of recipes is in fact the work of a 17th century woman by the name of Grace Carteret, 1st Countess Granville. 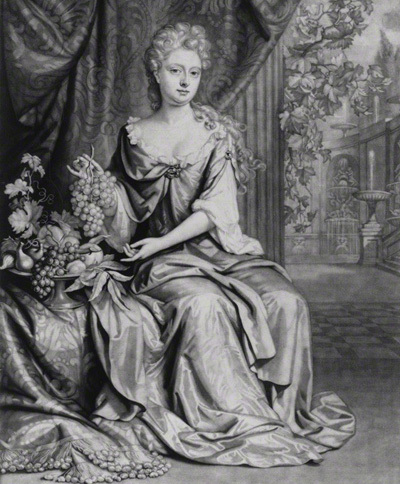 Grace (née Granville), Countess Granville and Viscountess Carteret by John Smith, published by Edward Cooper, after Johann Kerseboom. mezzotint, 1693. Image credit: National Portrait Gallery, UK. Written in a beautiful looping hand, the book contains hundreds of medicinal and culinary recipes, which would have been passed down through generations and exchanged between friends before being carefully recorded for posterity. Although the Carterets were wealthy, the majority of the recipes are not overly lavish and give a fascinating insight into how this family and others may have eaten and cooked in the late 1600s. Amongst them are many useful recipes for the Christmas period, such as “Mead Mrs Michel’s way”, “peaches in brandy” and “a goose to eat cold”. For Hogmanay there is a recipe for “Haggis Pudding”, while instructions on how to concoct “a purge to strengthen the liver” may be of interest to anyone staggering in to the New Year*. Scrolling down the index of recipes, there are a surprising number feature ingredients or dishes that are popular today: favourites such as cheesecakes and orange cake 75, and foods such as almond milk and almond butter, which have risen in popularity in recent months. On closer inspection Grace’s recipes are very different to the products we consume today, the recipe for almond milk involves boiling liquorice and “strawberrie leaves” in barley water, but it’s oddly comforting that some of the most fashionable new additions to the British larder are really not as new-fangled as we might think. It’s a bit like seeing fashions from the ’70s reappearing on the catwalks in 2015 and realising that each generation is just getting excited about something that their parents or grandparents were wise to long ago. There are no spatters of stock or batter on the pages and it seems unlikely that this book was a practical manual, pored over by a cook in the kitchen, but it does provide an insight into the labour required to make even a simple dish in a time before electricity or refrigeration, when cream cheese was made at home and to make ice cream required some form of wizardry with ice and salt. Some recipes will make even your longest Christmas cooking marathon seem like a quick fix, the instructions on how “To Souce a pigg” for instance begins at the very beginning with “Take a good fat pig…”, and give you a new appreciation for your kitchen gadgets. 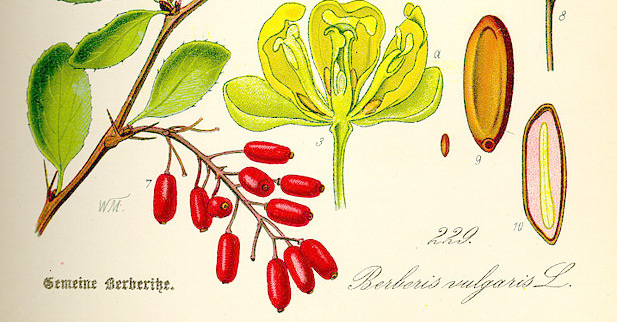 Barberries – Berberis vulgaris. Original book source: Prof. Dr. Otto Wilhelm Thomé Flora von Deutschland, Österreich und der Schweiz 1885, Germany. Image credit: Wikimedia Commons. This manuscript is one of an unrivalled collection of domestic recipe books from the 16th to the 19th century that are held in the Library. Others include the collection of Lady Ann Fanshawe’s recipes, whose family were close friends of the Carterets, and early editions of Mrs Beeton’s famous Book of Household Management. Many of them have been digitised and are available on the Library’s media viewer for anyone to read or download, you don’t need to be a Library member and it’s completely free. For the curious cook historical recipe books can contain a wealth of inspiration, so why not go and explore? Spend an hour with Grace Carteret and you’re sure to discover some fascinating food stories and trivia that could earn you serious foodie points. 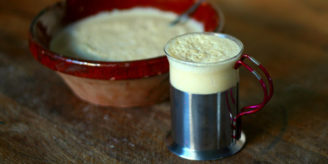 And if you’re still wondering what to do with last year’s barberries try this recipe. *The Wellcome Library offers no assurances for the safety of these recipes, or the efficacy of the remedies offered, and cannot accept responsibility for any illness or injury arising from their preparation or consumption.